SEATTLE — Brian Schmetzer hopped off the trolley carrying the MLS champions along their celebration route, and joined fans carrying banners and following the procession. Schmetzer grew up a fan of the original Seattle Sounders, played for the earlier incarnation of the Sounders and now as coach has led them to their first MLS Cup championship. It felt only right to be with the fans. "It's just the way I am," Schmetzer said. "I like being with the fans. I'm a fan, I was a fan for a long time. So it was just natural." Seattle feted the new MLS champions on Tuesday with a jubilant march through downtown Seattle, concluding with a rally at Seattle Center, just steps from where the first incarnation of the Sounders debuted in 1974 at Memorial Stadium as part of the NASL. After eight years of regularly being regarded as the most successful expansion franchise in MLS history, the Sounders finally reached the pinnacle of the league by defeating Toronto 5-4 on penalty kicks last Saturday night in Canada. Three days later, the scope of what the Sounders accomplished was driven home by the thousands of blue- and rave green-clad fans that lined the streets. Fans chanted, clapped and showed appreciation for the club that brought the city just its fifth championship in a major professional sport in the past half century, joining the Seahawks, two titles by the WNBA Seattle Storm and the SuperSonics. "It was way more than I imagined. Our fans continue to surprise me," Seattle's Jordan Morris said. "We couldn't have done this without them this whole season. There were a lot of downs in a tough season and they stuck by us through it all and that ended with a championship." It was the second straight year the MLS champions were paraded through the streets of a Northwest city, with Seattle following up on the title won a year ago by Cascadia rival Portland. While Seattle has won four U.S. Open Cup titles and a Supporters' Shield in its history, the Timbers took great joy in claiming an MLS Cup before their rivals to the north. 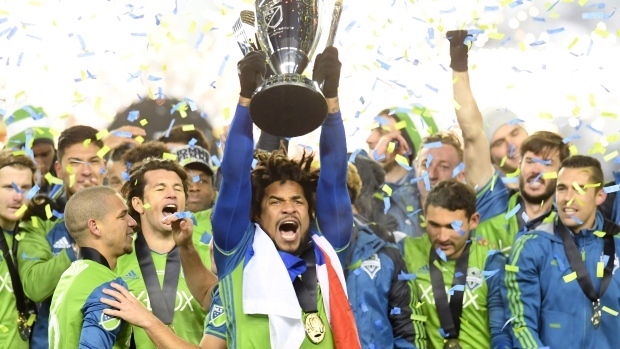 Seattle's championship completed the most remarkable midseason turnaround in league history. The Sounders were in ninth place in the Western Conference standings in July when Schmetzer stepped in as the interim coach after Sigi Schmid, the winningest coach in MLS history, was let go. Schmetzer's promotion — he ultimately got the job permanently — combined with the arrival of Nicolas Lodeiro and return from injury of Roman Torres to ignite the Sounders. They closed the season on a tear to finish fourth in the West, then nearly swept through the playoffs. Seattle won five of six post-season matches, its only setback a 2-1 loss to FC Dallas in the second leg of the conference semifinals when the Sounders already held a 3-0 lead. The capper was the title match in Toronto, holding the top scoring team in the MLS playoffs scoreless for 120 minutes thanks to an amazing performance from goalkeeper Stefan Frei. Torres then capped the victory with the deciding penalty in the sixth round of penalty kicks. "There is no game until March so I will be able to relax and soak this in," Schmetzer said.